1 Dip a cotton ball in rubbing alcohol. The best way to disinfect beauty tools with a metal surface is with 70% isopropyl alcohol, which you can find at any drug store, dollar store, or supermarket. Saturate a cotton ball with the rubbing alcohol, then gently squeeze it to remove any excess. If you don’t have a cotton ball, use a cotton pad, paper towel, or washcloth instead. 2 Wipe the curler all over with the cotton ball. 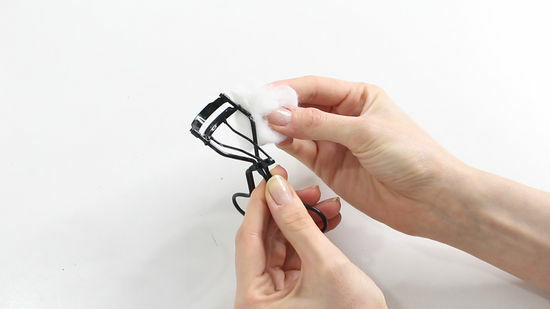 Use the cotton ball to cover every surface of the eyelash curler, including all of the metal, the handles, and the rubber pad on the inside. As you’re cleaning the curler, keep rotating the cotton ball so you’re always using a clean surface. If you need to, switch to a second cotton ball. Press the cotton ball down into the hinges and joints in the curler to make sure you don’t miss any spots where bacteria could be hiding. Tip: For a quick clean, just drop the eyelash curler into a cup filled with rubbing alcohol. Let it soak for a few minutes, then rinse it thoroughly. 3 Rinse the alcohol away with cool running water. Although the alcohol will dry on its own, leaving no residue, it can dry out the rubber strip on the eyelash curler. To avoid this, rinse the top of the curler thoroughly under running water after you wipe it down with the alcohol, especially around the pad. 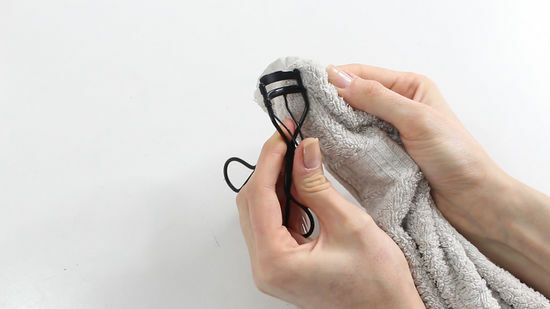 4 Dry the eyelash curler with a soft, clean towel. Once you’ve rinsed the alcohol off of the curler, gently pat it with a towel until it’s completely dry. Turn the curler in different directions as you dry it, and try to shake out any water that might have gotten into the joints. 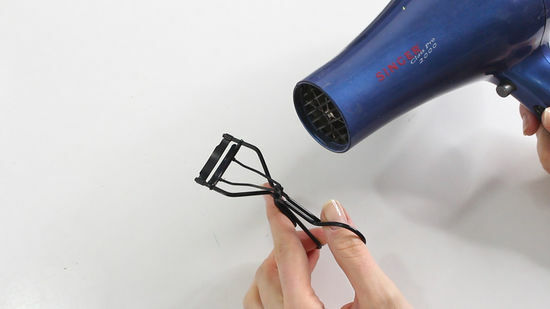 Allowing a metal eyelash curler to air-dry could cause it to rust.